Click Here to See an Overview Brochure of Holiday Themed Productions from L.E.D. From Traditional seasonal fare to twisted humor, Holiday is one of our specialties. Our productions bring dream worlds to your guests as they step from their cars onto a carpeted path and float through immersive experiences. With characters who guide them through engaging entertainment, guests follow stories that dazzle with beauty and talent and are led towards your specific event’s message. Hailing straight from Whoville, The Grinch is a singing, dancing, balcony leaping surprise of despicable fun. As a character from our childhood, we want to love his awkward, disgustingly green furry self as he springs about, taunting us and singing songs that only the Grinch would sing. His costumes are professional quality with a lush santa suit and prosthetic facial detailing. Get ready to wow them with This character who can really sing and dance! Like magical woodland sprites these illuminated creatures take to the lawn, halls, roof tops and trees tops after dark. Lovely and graceful in their movements and best when accompanied by live musicians with Illuminated suits, these magical nymphs captivate! Suspended (indoors or out) in her illuminated “chandelier” of icicles, this gorgeous aerialist will enthrall all who see her as she dangles, spins and literally dances on air. Floating above the heads of onlookers as a cellist or violinist plays an enchanting melody from the ground with softly falling snowflakes transform- ing the scene. *Note: The Snow Crystal Queen is even more wonderful when paired with the Luminary Fairies. Imagine a chorus dressed in white robes forms the shape of an angel on choral risers while projecting their harmonious voices for all to enjoy. At a strategic moment, video mapping or dynamic lighting effects transforms their robes into living canvases for moving media. *Note: Would be beautifully paired with a snow machine or lighted cold flow fog as well. 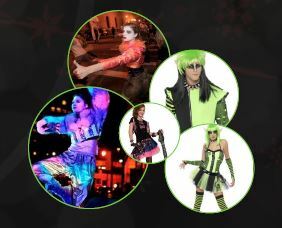 This lively and playful troupe of living toys (nimble toy soldiers, bendy rag dolls, metallic wind up toys, futuristic robots, hula figurines and juggling jesters ) can make their entrance out of an existing light scape themed with a tree and gifts or come tumbling out of the giant gift boxes that we create just for you. These are no ordinary toys though, these are world class dancers, acrobats, contortionists, hoopers, jugglers, roller skaters, cyr wheel artists and BMX stunt riders jumping 50 feet in the air off of custom painted ramps! Santa has been a very bad boy and he’s here to share his snarky, humorous “lounge singing” love with your adult audiences. Like every bad Santa, this one mostly spends his time in bars hanging out with his surly and colorful friends. The nice part about this 6’8″ tall Jolly Old Fella is his remark- able pipes….a fantastic lounge singer as well as comedic character actor, this Santa can entertain as well as pose for photos. We recommend adding Santa’s Mini Me (a little person in Santa gear) and some elf themed cheeky burlesque gals to add to the colorful holiday mini cabaret. High energy, power gymnasts dressed entirely in white and spewing a trail of “snow” in their wake cause a real commotion anywhere they go. Bounding, springing, flipping, and piling…like a human snowball fight gone mad, they are an explosion of winter fun. This act can be modified to work on ice or roller blades as well as ground. Stilted Forest creatures (four stilts, arms/legs) with fur made of “fir”. The “dogs” are ambient characters who can pose for photos, wander inside or out and can keep the audience guess- ing with their antics (when upright, they appear to be trees…then they go onto all 4s and walk). A natural artful interpretation for any holiday landscape scene. This live ice sculpting performance takes place to a rousing music score. “Snow boarder” style ice dudes with blue face paint and goggles wield power tools as they craft their amaz- ing designs. Carvings can be done in virtually any shape, theme, brand message or logo and can incorporate lighting effects, pyrotechnics, fire and other special effects. Live entertainers with fire whips and fire fans can be added in the center of the ice to be “released” as the sculpture takes shape adding an even more surreal feel. Our army of elves comes in various shapes and sizes, with a variety of talents upon request. From your traditional Santa helper types, to funky looks with green and orange chunky knits and brocade puffs of clothing, to punk rock and street style elves, we have a style that will blend with your Christmas theme. The elves are the helpers at the party who surround your guests with fun and surprises. They can be servers, or fire spinners, or flow and glow prop spinners, or acrobats, or flashmobs and choreographed dancers. Ask for their help and add some elfin fun this season! A Sassy, spunky comedic band of entertainers who appear quite out of nowhere to own the room or the outdoor space they land in. Dressed in Cindy Lauper meets Santa’s Workshop inspired elf gear, these are not your average little helpers. The Elf Invasion can take place indoors or outdoors or both at different times of day (and break into a holiday remix of awesome break it down boogie or burst into a comedic remix musical song (think Deck the Halls but with the words all changed) to amuse young and old alike with their mischievous mayhem. As an option, at night, the Elf Invasion can illuminate (all costumes can have lighting) and can participate in or lead holiday parades. They are also great with kids (very animated and fun) and can conduct “Santa’s Workshop” craft stations as well. This hand balancing pair (2 or more people, if you want body stacking feats) offer stage shows and walkabout partner acrobatics that are high quality, circus level entertainment. With dance and gymnastic backgrounds, these performers have an artistic and musical flair that compliments their strength and form. They are thematically presented in candy cane striped full body unitards and accessories to match a holiday theme. Imagine, our lovely, young cherubs singing at your event! Pairs of chorus singers dressed in shimmering white (with optional angel wings) hold up their folios of sheet music and sing live as guests arrive, or around food services. Warm an area of your event with real voices and traditional songs. The richness of live music will spill throughout your event awakening all of your senses. Whether they are classical and jazz cellists and violin players, or comedic ukulele and accordion players who sing ridiculous, bawdy songs, or a full band, great quality live performing can make an event especially memorable. Those who make the rhythm will create the tempo for your guests at the event, manipulate their moods, set the stage for presentations, gather crowds onto dance floors, and get us all on the same beat. L.E.D. 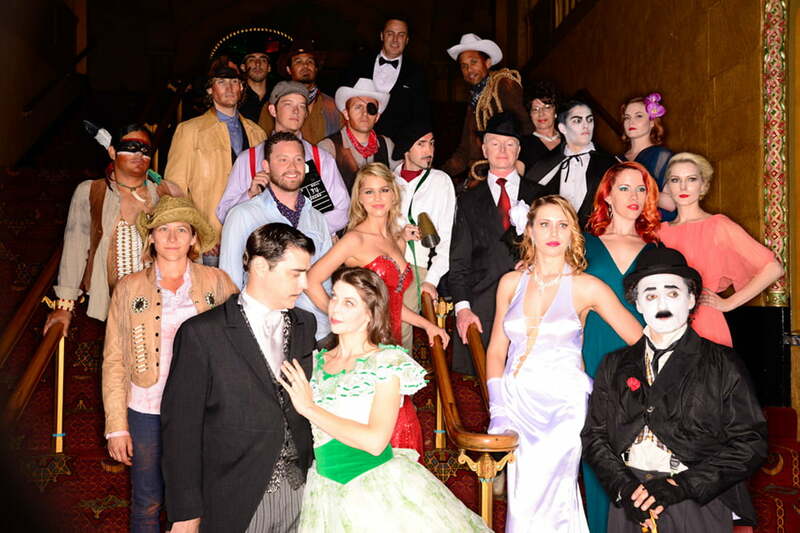 Entertainment brings the golden age of Hollywood back to life for your event! Your guests are surrounded by lookalike actors that are sprinkled throughout the event site, deeply involved in their own era and characters. A director and his paige boy are working as if the films are in the very process of being made. Vampires in the rafters, cowboys and indians doing stunt fights at the bars, Charlie Chaplin’s antics, Rhett and Scarlette’s romantic exchanges, Gene Kelly dancing in actual rain on the sidewalk and lamposts outfront, and gorgeous starlettes and period photographers were just some of the surprises! Each actor has speaking role and talents that help them match up to their character and make an interactive experience for guests. 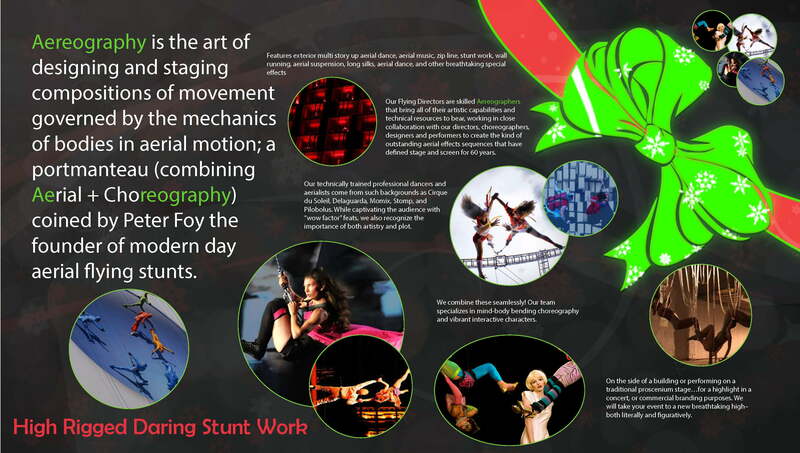 Aereography is the art of designing and staging compositions of movement governed by the mechanics of bodies in aerial motion; a portmanteau (combining Aerial + Choreography) coined by Peter Foy the founder of modern day aerial flying stunts. Our Flying Directors are skilled Aereographers that bring all of their artistic capabilities and technical resources to bear, working in close collaboration with our directors, choreographers, designers and performers to create the kind of outstanding aerial effects sequences that have defined stage and screen for 60 years. Features exterior multi story up aerial dance, aerial music, zip line, stunt work, wall running, aerial suspension, long silks, aerial dance, and other breathtaking special effects. On the side of a building or performing on a traditional proscenium stage…for a highlight in a concert, or commercial branding purposes. We will take your event to a new breathtaking high– both literally and figuratively. Our technically trained professional dancers and aerialists come from such backgrounds as Cirque du Soleil, Delaguarda, Momix, Stomp, and Pilobolus. While captivating the audience with “wow factor” feats, we also recognize the importance of both artistry and plot.We combine these seamlessly! Our team specializes in mind-body bending choreography and vibrant interactive characters. A high flying troupe of stunt flying dancers dressed in reindeer costumes will wow the crowd as they literally take flight using vertical surfaces as their dance floor! Supported by world class stunt riggers, this act is equal parts danger and beauty… and an unforgettable, one of a kind spectacle! Mysterious “light man” figures in illuminated costumes pilot these giant orbs in a choreographed “ballet”. The 15’ diameter zorbs take on the appearance of lovely, enormous ornaments that have fallen off the tree as they reflect the shine from nearby light installations and /or illuminate with their own L.E.D. glow. As a thrilling twist to the usual s’mores and fire pit fun, these talented fire manipulators dressed in toy soldier ensembles or as a fairy with a crown of fire or wings of fire and a fire hoop, will amaze all who witness their dangerous art form.